Equidays is excited to announce a partnership with Kaimanawa Heritage Horses (KHH) to launch New Zealand’s first wild horse challenge, the Major Milestone. This ambitious event seeks to place 25 wild and untouched stallions with the nation’s leading horse trainers who will compete for $15,000 in cash and prizes. KHH created the challenge to highlight the talent and trainability of wild Kaimanawas through a national training initiative. After being selected, trainers are randomly assigned an adult Kaimanawa stallion (over three-years-old), which will then have to be gelded to be eligible to compete. Trainers will have 150 days to build trust and develop a relationship with their horses to ensure the best possible performance in the halter and/or ridden classes. Trainers will then go on to compete in the Stallion Makeover Challenge at the 2015 Horse of the Year Show. The excitement will be huge as the top ranked stallions battle it out in the Premier Arena during the Friday Night Extravaganza, with a sizeable purse on offer for the top six finalists. The challenge was named in memory of Major KH, who was believed to be about 17 years old and was rehomed to the Wilson sisters in the 2012 muster. He made his first and only public appearance at the 2012 Equidays and delighted the crowds with his ability to embrace domesticated life. Although Major passed away only five months after he was mustered, the remarkable stallion made a huge impact both nationally and internationally, challenging every preconception about what an older wild stallion should be like. The Major Milestone will debut at the 2014 Equidays and will be limited to 25 stallions. For further information visit the challenges webpage. With the next muster due in late Autumn 2014, now is a great time to spread the word about how people can help the horses. If you are able to write an article for any publications or web-pages, and would like some help getting started, we have published a press kit containing a summary of everything relating to the Kaimanawa horses. See the Press Kit page for more information. Our new 2014 calendars have arrived, full of pictures of the Kaimanawa Horses in the Wild. These make a great gift for friends, family, and yourself. Calendars cost $17.50 + $2.50 P&P and are available through the merchandise page on our website. 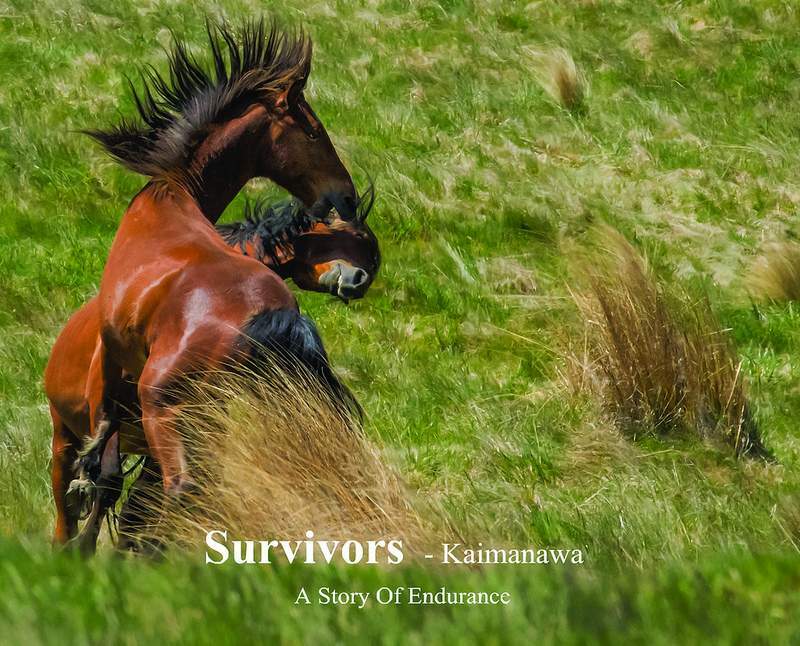 The fabulous photographic book ‘Survivors – Kaimanawa. A Story of Endurance‘ is also available, with photographs by Kimber Brown, Susie Hare, and Abey Vasey, and words by Simone Frewin and Kristine Jones. Learn more about the horses and their history. This costs $27.50 + $2.50 P&P. If you buy both the 2014 calender and the book, you can have them for the special price of $40.00 + $2.50 P&P. Please visit the merchandise page on our website to place your order. Come and join us on a guided bus trip through the Waiouru Army Base land. This region is normally closed to the public and we are privileged to be able to offer you this experience. The next trips are on the 30th November and 1st December 2013. See foals, mares, yearlings, and stallions in their family bands. There will also be a stop at the yards where the horses are mustered, and you will see the spectacular scenery where these horses run. Accommodation is available at the Ohakune ski lodge on the Friday, Saturday, and Sunday of the trip.